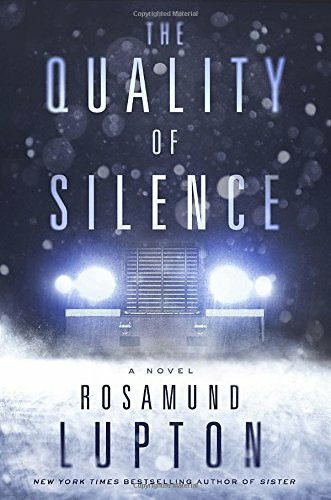 You could read The Quality of Silence in the middle of a sweltering summer day and still catch a chill: first from the eyelash-freezing Arctic setting, and then from the creeping dread that grows with every page. Rosamund Lupton's thrillers almost always hit the mark for me—they're smoothly written, peopled with rich, complex characters, and each one is an entirely fresh experience. There's no rehashing of old ground here, and I mean that quite literally. Yasmin and her young daughter Ruby set out on the ice roads in Alaska's northern wilderness, a place so vast and desolate, it seems barely touched by civilization. They're in desperate search of Ruby's father, presumed dead in a terrible accident while in Alaska for work. Yasmin doesn't believe her husband is dead, and when no one in authority agrees with her, she has no choice but to go find him herself. But there's an ice storm brewing and there are ominous blue headlights in her rearview mirror, a faceless but menacing stranger following them through the endless night. Ruby and Yasmin take turns narrating, sometimes switching every couple of paragraphs, which is a bit disorienting. It wasn't difficult to follow, it just felt awkward and hurried—I would have preferred a more typical every-other-chapter pattern for readability. However, despite the occasionally jerky transitions, I warmed to Ruby's voice immediately. Profoundly deaf since birth, she has a unique and charming way of seeing the world. I love how Lupton shows Ruby's deafness as both a deficit that complicates their lives and a boon that makes her the special girl she is. With regards to Crown Publishing and NetGalley for the advance copy. On sale today, February 16!